MUKTAR SULEMAN was brought up in Durban and came from humble beginnings. With no opportunity for tertiary studies, he left school after matric and found his first job in a clothing store. His next job was in a jewellery store, but neither of these positions really sparked his entrepreneurial spirit. It was only when he got a job as a driver for a tarpaulin company that the dream for Royal Tent and Tarp began. "No pilot is born a pilot", says Suleman, "And if it can be done, I can do it!" It was this philosophy, and his interest in the industry, that drove him to learn as much as he could to pave his way for the future and founding Royal Tent & Tarp in 2003. Breaking into any industry is hard, and challenges are inevitable. "You have to face the challenges headon and persevere," says Suleman, "Giving up is just not an option." 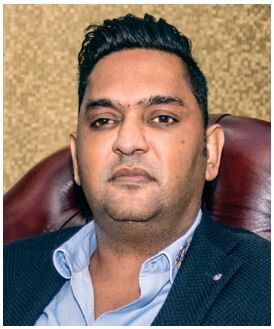 Clearly his persistence has paid off, as he has grown the company from a start-up into an international business, with 24 branches in South Africa, in only 15 years. Suleman believes in leading from the front. "In order for me to get the best results from my staff," says Suleman, "I have to be in a position to do the job myself first." So, it's unsurprising that he's very handson in the business. That said, however, he recognises the importance of his staff and is very willing to listen to their suggestions. Workplace culture is a priority for Suleman and he believes respect, skills development and opportunities for growth are integral to that workplace culture. And allowing staff the opportunity to contribute to the business direction is a sign of his respect. With a full-time staff of 170 people, maintaining the culture and the drive for service excellence works because it is a priority. "My wife and family are vital to my success," says Suleman, "and they inspire me on a daily basis. My wife is involved with the business and is truly supportive of me. We have travelled a long road together and her support, hard work and drive to succeed have allowed us to build up this business from small beginnings." The Royal Group has grown to incorporate five companies, including two unrelated business (a bridal and evening wear boutique with two retails outlets, and a third to be launched shortly, and a beauty salon) Royal Plastic Chairs, Royal Plastic Tanks (Suleman's latest venture), and, of course, Royal Tent & Tarp with 24 branches across South Africa and international sales. Despite this growth, Suleman still identifies purchasing his first business property as a highlight of his career. He points out that "This, and the investment in the machinery needed to improve the business processes created the foundation of our business success." Tents and tarpaulins are where the business started, but diversification has added growth and Suleman has been unafraid to step up and invest at each critical moment. "Investing in new equipment and space is essential in a manufacturing environment," says Suleman, and extending our range has allowed us to create a one-stop shop for many of our loyal customers, adding new business from our existing market. Watching my business grow is a highlight for me." Royal Tent & Tarp has adapted their business over the past 15 years, and will continue to adapt and grow. Suleman has a vision for the future and says he has already begun implementing plans to achieve this vision, but this is still in the initial stages. On a personal level, Suleman and his wife Zayeeda Suleman, have three daughters and a son. Family time is very important to them and they believe that a family that prays together stays together. Suleman also enjoys travelling, reading and educating himself on modern technology that can assist him in taking his business forward. Asked what advice he would give to aspiring entrepreneurs, Suleman notes, "In order to be successful, you need to be prepared to work smart, be persistent and never consider failure as an option."